Chili Peppers- you can grow that! It’s salsa season here in the west. Around here, the trucks from New Mexico are parking at the farmer’s markets, or in random parking lots, setting up propane roasters, and the air smells like home. Not the home where I grew up- I don’t have childhood memories of this scent. It’s the home I want to be. Meet Big Jim- about 8 inches long and full of fun. .My mistakes with chilis in the past has been not enough space, and not enough water, and not enough sun. In the past I have always crammed them in with the tomatoes, because when you come home from the nursery, they are all little tiny. The poor chilis would get crowded out and shaded out by their neighbors. 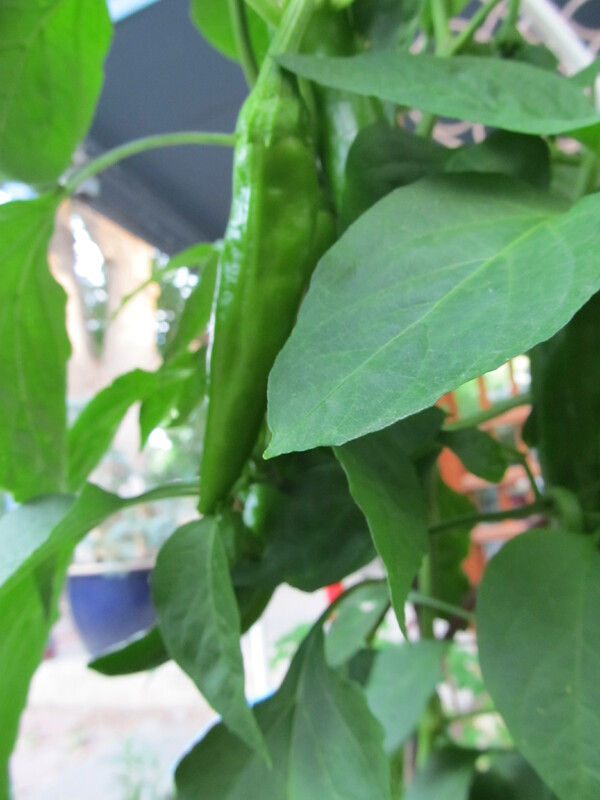 This year, I came home with two plants, “New Mexico Big JIm” and “Jalapeno” and actually gave them some space, in the small veggie bed by the back door. Three years ago, I put two tomato plants and two peppers in that 6 square foot space, and by July, the tomatoes had swallowed up the peppers, and I almost forgot I had planted them. This year, they have space to stretch out, nice deep soil (I’ve been adding organic matter to this bed obsessively- leaves, compost, coffee grounds), and they are amazing. The “Big Jim” is aptly named- about the same flavor as a Serrano, not too hot. I think their highest purpose would be to be stuffed with cheese, and fried, but probably we’ll just roast them and put them in quesadillas. The jalapenos are just hot- I like them in a nice salsa fresca- tomatoes, onions, chilis, cilantro, all chopped up with a squeeze of lime, and scooped up with chips. Don’t freeze it, don’t can it, just get it while it’s hot.